# 23 Jul 2004 - Upgraded with more information on the different instrument clusters and more Atmel code plug information. # 12 Oct 2004 - Fixed incorrect info about the back plate covers. Thanks for pointing them out Oahu Steve! Problem: The odometer stops at 299 960 km or 300 000 miles. Models: All E32 models manufactured before 02/89. This also applies to E34 models with a "high" version of the cluster. If your E34 has a check control display it's the "high" version. Push the odometer reset button on the cluster while turning the key from I to II. On the affected clusters it will show a number. On the newer clusters it won't show anything, but if you press the other button while turning the key you will see a self test. This test will start with some information on your check control display. More on this test later. The back cover of the affected cluster is grey. The newer clusters have a blue or a white cover. 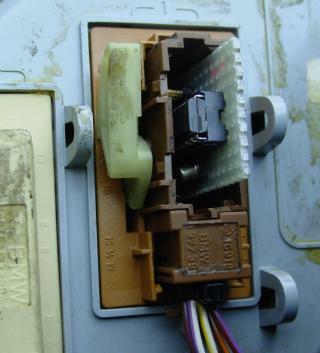 There is a code plug in the brown plug that goes into the older cluster. The newer cluster has the code plug integrated in the back of the cluster. The speedometer shows a number behind the K. The newer unaffected clusters just have EG on them. My guess is that the EG stands for "electronisch geregelt" which is German for electronically controlled. The newer clusters also show a K index in their test mode. 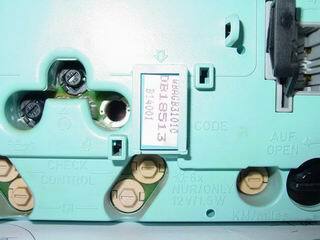 Background: The specific vehicle information is stored inside the code plug. The information inside the plug is: the fuel tank capacity, automatic or manual gearbox, electronic automatic gearbox with S/E/M switch or standard automatic gearbox (I've only seen these on the 730i 6 cylinder), the fuel consumption calculation data, the temperature indicator offset and off course the mileage of the car. There are three versions of the instrument cluster all with their own code plug. You can't interchange the code plug in between the different versions, but you can swap the entire cluster. 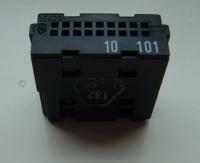 Do be advised when you take the old cluster you need the code plug that's mounted inside the brown plug. Of the failing odometer in euro cars I've heard about 99% stop at 299 960 km. US cars do seem to make it to 300 000 miles before freezing up. There is no clear reason for me why the counter stops. The chip's internal representation is 40km higher making it 300 000 which still doesn't give any clue as to why it stops. The BMW number. Probably the number starting from the 1st ever BMW manufactured. The K-Zahl. This has something to do with the speedometer correction as it's completely electrical on the new clusters. It's actually the same number as printed on my older cluster. Both came from 735i's. The F.G.Nr. These are the last seven digits of your VIN. The SW version inside the cluster. The AND Index. This is the "�nderungs-Index" or change index. Thanks for the information Wolfgang! Get used to it. Write down the mileage of the trip counter on the fuel receipts and add these up every month so you can at least account for the mileage when selling the car. This is a very cheap option. 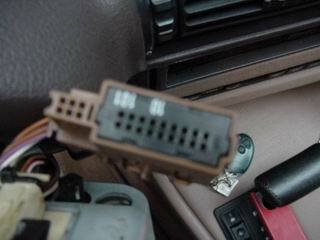 Get a used code plug out of a car with the same configuration that has some life left in it i.e. it's still under 300k. A used code plug should be 5 to 20 Euro/US$. Have a look around the scrap yards. Do check that it comes from the same type of vehicle. Getting the plug from a car with a manual box will disable the automatic gearbox program, getting a plug from a v12 into a R6 will mess up the fuel consumption,...etc. Don't try looking for the exact same code plug number as these numbers are unique. Get a new code plug from the dealer. This will start the counter back at zero. You will need the VIN number of your car and the code plug number. The number can be obtained by turning the key from I to II while holding the odometer reset. The number is also printed on the code plug itself. This will set you back about 110 Euro/US$. This should not active the red LED that indicated the odometer has been tampered with. Have the plug reset to zero. You've probably seen ads in the paper that got your petrol enriched blood boiling: "Mileage adjustments for all cars". Well time to call them. As the affected code plug is a microcontroller instead of a standard serial EPROM you can't write to the data area directly. So most of these guys who claim to have the equipment can't do this. So they have to send it out to someone else. If that's the case don't bother as this will make it expensive. Before I had a full understanding of this problem I had my plug reset for 70 Euro/US$. Which was way over the agreed price of 45 Euro/US$. Get a newer type cluster with code plug and all. Install this into your car and then you can choose to have it reprogrammed to 300K. This is the nicest way to solve the problem. And again see that the code plug comes from the same car configuration as your own. You can find a used cluster for 16 Euro (fleabay) to 100 Euro (breakers). Reset the plug yourself: I haven't checked it yet, but I was told by someone you can clock in a speed signal of 100 kHz. This equals a very high speed (about 60 000 km/h). The plug should then store the mileage in it's RAM. As it can't write settings over 300K in into the ROM area 300K you will have to wait until it's been around 1 000 000 km. It should then write 000 000 back into the odometer. This costs about 0 Euro. Highly recommended. If you have tried this and it works I LOVE to hear from you!!! The schematic on the Diakom page speaks of pin numbers over 20 while the plug only has 18 pins. 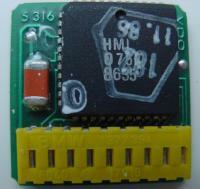 This was easily solved when I found out the referred pins numbers are the pins of the HML075 IC. Anyway the code plug has pins 4-12 on the lower row and the higher row has 16-4. Nothing showed up at all. Leaving out resistor "R102" on the schematic solved this. After fitting the plug to the car the service interval information kept resetting itself and every now and then a "kuhlwasser temp" or coolant temperature error came up on the display while there was nothing wrong. The solution to this problem came from Fred a member of the 7er.com/forum. 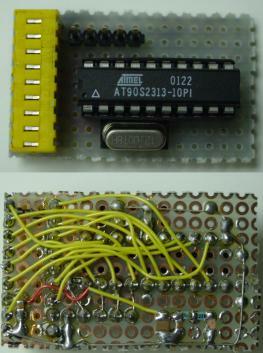 Change pin 7 and 9 (PD3/INT1 and PD5/T1) on the Atmel. Now the cluster still behaves strange. It still doesn't show the transmission program (Sport/Economy/manual) and the fuel consumption is twice the actual value (that or the Atmel runs on petrol :-) ) So I still need to copy the information from the original code plug. When I get the time and urge to play with it again I'll write a piece of code that allows an Atmel to read the code from the original plug. If you want to have a go at it the timing is explained on the Diakom webpage. 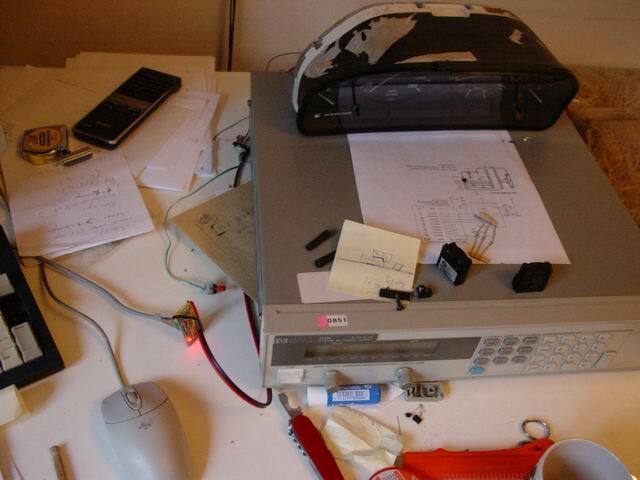 My test setup on my desk with the extra instrument cluster from the 735iL parts car (also stuck at 299 960 km). In the picture you can see: a power supply, an instrument cluster, two code plugs, a small circuit that give a speed pulse from 140 km/h to 250 km/h and the Atmel code plug connected to my pc + power supply for programming. I used an assembler from Atmel's homepage and a little program called "Sp13" to download the code into the Atmel under DOS or Linux. Thanks to everybody who supplied me with extra information! If you would like to add any comments, remarks and/or corrections to this procedure, feel free to email Mike Oswald and we'll put it on our si te. Share your experiences with us so others may benefit from it.